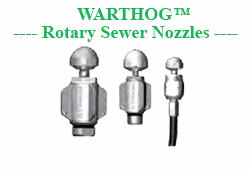 Cloverleaf Tool Company - Sewer Nozzles, Aluminum Grease Nozzles, Aluminum Storm, Aluminum Sand, Warthog Nozzles, Shark Nozzles and more. 8 SS Rear Jets(Replaceable) For 10” Plus Lines. Front jet & 16 Dual Degree Rear Jets. Heavy Cleaning of 10” to 20” Lines. Front Jet & 8 Rear Jets. For 10” to 15” Lines. Sand, Dirt, Gravel, etc. Replaceable Jets – 2# - 3” x 2¼"
Front Jet & 3 SS Rear Jets (Replaceable). Great For Culverts, Grease, Roots etc.